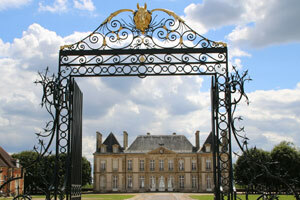 The magnificent entrance to “Haras du Pin” – the French National Stud. Spent a good proportion of the day out at Haras du Pin. It took us over an hour to drive there from Caen, and while the first half of the drive was on a good motorway, the last part of the drive took us through small villages, many roundabouts and fairly narrow roads. I am thinking that there will be some slow trips out on cross-country day when there are 50,000 people wanting to get to the same place! Trick riding at the open day. Thursdays are “Le Pin” day – when the stud puts on a show lasting about an hour and a half. We first took up the opportunity to visit the museum, and then have the guided tour of the stables, being able to pat the magnificent Percheron stallions who were ultra-laid back. The stables and buildings were that beautiful old-worldy ones, which made you think about things like how many horses would have seen them, how they built them so well so many years ago manually, and then, being from Canterbury, how would they cope in an earthquake! There must have been at least 2000 people watching the exhibition. The highlight for me was the beautiful white Percheron stallions. There were a couple of mares and foals, an arab stallion and a couple of vaulting / trick riders. The little donkey did a good job of pulling his cart, without looking too enthusiastic, and the young sport horses did some good jumping, although I don’t think the one who fired his rider into the jump stand instead of jumping the jump would get extra rations tonight! The area in front of the main “house” is where the trot up will be, and we did get a look at the arena where the eventing dressage would be. Our guide did not know where the cross-country course went and we couldn’t see any jumps from the public areas. The dressage arena stands looked very small, and very close to the arena. It certainly didn’t look like a world championship arena, but hopefully it will produce some world champion tests! As we travelled back, we heard the sad news that Michael Jung’s Sam is out of WEG. Even though I’m supporting another team and other horses, I can’t help feel disappointed, as this horse is such a class eventer and I so enjoyed watching him the one and only time I have seen him perform before, at Badminton in 2013. I am just glad that Michael has a worthy replacement. The grave of Furioso, one of the most influential stallions that has been based at Haras du Pin, sire of many well performed sports horses over the years. He stood at stud until September 3, 1967, when he died of a heart attack at the age of 28. The arena for the dressage phase of the eventing competition is ready and waiting. The magnificent percheron horses on parade. An arabian stallion on show. A little donkey played a role in the demonstration. Several young sport horses were put through their paces at the demonstration. Bridles and other tack line a stable wall.